How were y'all's weekends? Mine was good--lots of relaxing (I even started reading Heart of the Matter by Emily Giffin and am hooked) and time spent with family. Finally, the cherry on top this weekend was a beautiful snow Sunday night--check out the Sundresses and Smiles Facebook page, here, to see a picture! Additionally, my aunt is continuing to recover very well. I appreciate all of your kind words over the weekend. As a blogger, it can be scary to open yourself up in such an honest way, particularly about something that is tough. I was nervous to post what my family has been struggling with, but, all of your support and kind words showed me that the blog really is a place for me to be my whole self. Today I thought I would give you a recap of my Valentine's Day with Bryce. WOW! Can't believe it was already a whole week ago. Bryce and I decided that we wanted to stay in and cook dinner together rather than going out. For me personally, going out to a fancy restaurant surrounded by other couples celebrating Valentine's Day, takes away from a bit of the romance and intimacy of the holiday, so I was glad to be staying home. When I arrived at Bryce's he had the table set up! When I arrived we quickly got to work on dinner: A mixed greens salad, Halibut, and Risotto. It all turned out so good that I even went for seconds! Garnished with red lip sprinkles and mini chocolate chips! It was delicious, but a little too rich for my tastes (perfect for Bryce's)! After dinner, I presented Bryce with his two presents. We both had agreed not to get each other extravagant gifts, but I did want to do something special to show him how much he means to me. First on the list were these chocolate covered pretzels I made! Next was the big gift--"52 things I love about YOU!" "52 things I love about YOU!" Rather than bore you with ALL 52, I'll just share a few of my favorites. I tried to keep the list a mix of serious and silly things. "I love your cute TUSH!" "I love when you SING to me!!" "I love that you're a true Southern gentleman." "I love that you're kind and friendly to everyone you meet." "I love that you ALWAYS make me feel beautiful!" "I love that you give without expecting anything in return." "I love that you put up with my whining." Guilty...I can be a whiner! "I love that you never give up on US!" Bryce really loved this gift and snickered when I admitted the idea was from none other than Pinterest! 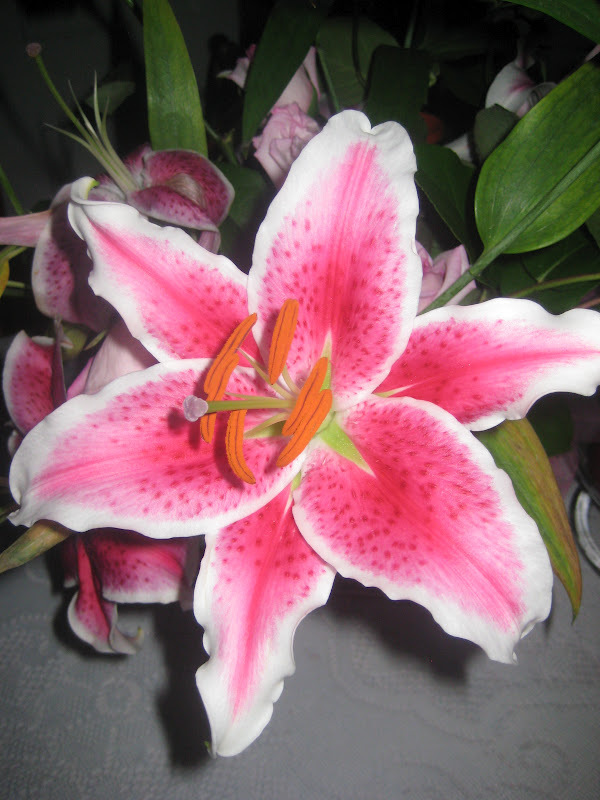 Bryce gave me the most beautiful bouquet of pink roses and stargazer lillies (lillies are my favorite flower), which I mentioned in Friday's post. As promised here is an updated picture since the lillies have begun to open up more--they are SO gorgeous! Bryce can't stand when I rub my "ice cubes" on him to try and warm them up! All in all, it was a wonderful Valentine's Day and a really special time to celebrate our love! this 52 things idea is too cute! and you'll love heart of the matter - it's great, i've read ALL of her amazing books! Glad to hear your aunt is doing well! That is such a creative and adorable idea! Absolutely adore that you did the 52 things deck of cards! Sounds like a great Valentine's Day recap to me! I made my love the 52 Reasons why I love you, for Valentine's Day also. It was a hit!! That's such a cute idea! I hadn't seen the 52 reasons. Maybe I'll be stealing it from you; my husband would also snicker about the fact that it's from Pinterest. Your chocolate mousse looks divine; I can't wait to see the recipe! It looks like you had a great Valentines Day!! That dessert looks delicious, I can't wait for the recipe! What a beautiful way to spend Valentines day. What a perfect Valentine's Day! Love the cute deck of cards idea and your flowers were gorgeous! ps - isn't Heart of the Matter such a great book! Love it! I just read the post about your aunt. I am so sorry! I lost one of my aunts this past October to pancreatic cancer and it was just awful for so many reasons. Hopefully your aunt will have a speedy recovery! I'll be thinking of you!! What a special night! :) Loved seeing your sweet notes! What a great Valentine's Day! I love what you made for him. So adorable. Aw, looks like a great Valentine's day! I hope you'll let us know how Heart of the Matter is. I can't wait for you to post that recipe! Looks delish! What a wonderful Valentine's Day! That chocolate cake looks delicious! I LOVE all of Emily Giffin's books! My favorite is Love the One You're With, but Something Borrowed and Something Blue are both fabulous, too! love the 52 reasons why... I am feeling much better thank you so much!! How sweet! Lillies are my favorite also. Thanks for commenting on my color blocking post today. I know what you mean about the color blocking. It can go really wrong if not done right! And I completely relate about the ice cube feet. I always make my boy sit on my feet while we're watching movies to keep them warm. What good boys we have! looks like you had a wonderful valentine's day! and i love that deck of "52 things i love about you" - what a cute idea!!! Oh this is just so sweet and your flowers are gorgeous!! You two are the cutest, seriously! I love romantic Valentine's Day dinners at home--they're so special and intimate. The pretzels and dessert you made look amazing and I adore the 52 reasons idea. those cards are too cute!!! !